Big Brother 19 spoilers tease a major power shift in the BB19 house following the week 3 HOH competition. Paul Abrahamian was the outgoing HOH and really wanted Kevin Schlehuber to win the competition to keep the power on their side. However, Alex Ow was a determined woman and outlasted everyone during the endurance competition. Jessica Graf really wanted to win the HOH competition to prove herself a strong player, especially after her “boyfriend” Cody Nickson was evicted minutes before the competition started. She felt that she needed to win or she could be sent out of the Big Brother 19 house next. Jason Dent, Elena Davies, and Alex battled it out to win the HOH competition. In the end, Alex promised Jason and Elena safety for the week. Immediately after Alex Ow won week 3 HOH, the mood in the BB19 house shifted. Paul was no longer ruling the house, and everyone scrambled to see where they stood and who could be targeted during Week 3. Big Brother 19 spoilers suggest that Jessica may not be nominated this week. Flashback to 9:23 p.m. on BB19 live feeds, Jason and Kevin instruct Alex not to waste a nomination on Jessica. 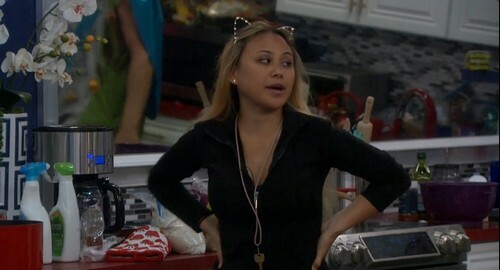 They say that she is “useless” and “can’t win challenges” so she is “good for another number and vote.” It looks like Jessica may be safe this week if she can stay calm and not rub anyone the wrong way. Alex wants to chat with everyone alone and get a feel for where people stand. At this point, she thinks she is putting up Christmas Abbott and Dominque Cooper. She explained that Christmas is hurt and is dead weight in challenges so it may be time for her to go home. And, Dominque is a “flip-flopper” and switches sides on an hourly basis. Of course, Alex could change her mind after talking to everyone and has a few hours to think about who is the best person to target for eviction. Paul isn’t going to be happy when he learns that Christmas could be nominated and has a slim chance of winning the power of veto to save herself. Big Brother 19 fans, are you happy that Alex won the HOH competition? Don’t forget to come back to CDL for all your Big Brother 19 spoilers, news, and live feed updates!